By the end of every summer in New York, we immediately turn to thoughts of winter. With such a wide range of weather possibilities, the only thing that can be certain about a winter in NY, is that it will be cold and unpredictable. That is why it is so important to be prepared for the changing seasons in every possible way. Whether that means tuning up your trusty snow blower or checking out capable used cars in Albany, NY – preparation is key. While exact timing is tough to predict, snow-covered roads, ice-coated highways, and freezing temperatures are all likely as we exit summer and fall. Whether you are a seasoned New Yorker who has braved countless winters in the northeast, or this is your first east coast winter, it pays to be ready. As a dealership in Albany that specializes in used Chevy cars, trucks, and SUVs, we are your go-to source for all things automotive when it comes to the changing seasons. As a dealership here in NY, we realize that not everyone wants to drive around in a large SUV twelve months out of the year just for a few months of snowy conditions. While some drivers love the feeling of sitting behind the wheel of a Suburban or Tahoe, it isn’t a practical option for the vast majority of buyers. We have taken the time to compile a list of the most winter-capable Chevy sedans that you can buy pre-owned at DePaula Chevrolet today. Discover each one by exploring below, and see how as a car driver, you can be just as prepared for winter in New York as someone behind the wheel of a bulky SUV. Chevy Cruze: The Cruze has been around for a while now, which makes it a great option for used car buyers on a budget. It is considered a compact car offering by the bowtie brand, but unless you read that label somewhere, you would never know just by its size. The sedan is large, with notably ample trunk space and plenty of interior room for the comfort of five passengers. 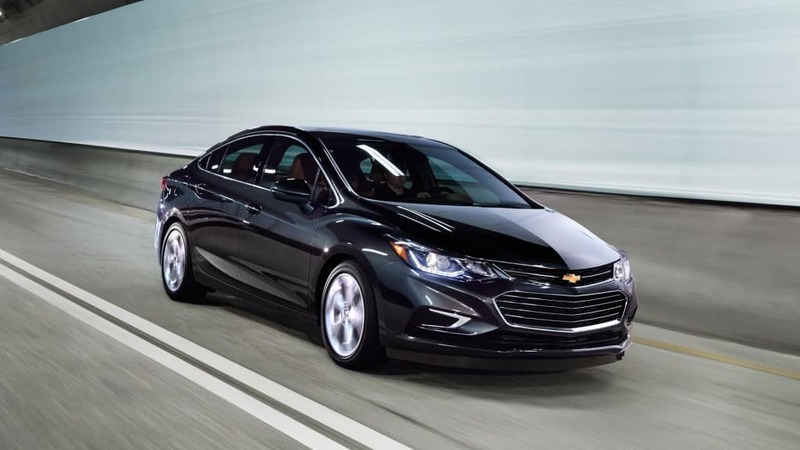 With new models starting just over $16,000, pre-owned Cruze models are budget-friendly and can be found for much less, depending on the model year and featured amenities. Capability: The Cruze comes standard with front-wheel-drive, but drivers who can expect occasional snow and icy road conditions can opt for an all-wheel-drive option. The Cruze is offered with a 1.6-liter, 1.8-liter, or 2.0-liter turbocharged engine. Each one expertly complements the sedan, aiding drivers through various and changing road conditions. Safety: The Cruze is loaded with great standard safety equipment, as well as plenty of options to up the safety ante. Rear parking sensors, blind-spot monitoring, rear cross traffic alert, a rearview camera, and 10 standard airbags, all help make the Cruze more ready to tackle winter here in New York. Bottom Line: For drivers who commute long distances, but still want the interior room of a larger car and the fuel economy of a subcompact – the Cruze is perfect. Plenty of capability for navigating winter roadways, the Chevy Cruze delivers plenty of everything drivers in this segment are looking for. Chevy Malibu: Don’t let its name fool you – the Chevy Malibu is so ready for winter in NY, that it should be renamed the Chevy Malamute. With a history dating back to 1964, the Malibu has plenty of used versions available and is great for families as well as commuters. Capability: Newer versions of the mid-size sedan feature all-wheel-drive, which is highly recommended for buyers who expect to be spending a lot of time navigating snow and ice-filled roadways. Aside from having the ability to power through snow, the Malibu offers efficient engine options that can boast up to 250 horsepower. The 2013 Malibu was awarded “Most Dependable Midsize Car” by J.D. Power, which solidifies the fact that this sedan can be counted on when it really matters. Safety: The Malibu is one of the safest cars in its segment, and has come packed with standard safety features for plenty of past model years. Newer models that were upgraded offer low-speed front automatic braking with lane keep assist, which works together to avoid potential collisions. This technology can truly be lifesaving on icy roadways, as well as in everyday driving conditions. Bottom Line: The Chevy Malibu makes an exceptional pre-owned car to buy for the changing seasons here in New York. The recipient of numerous top safety awards from authorities in the industry, the Malibu offers much more than a low starting MSRP and winter-ready capability. Chevy Impala: After a four-year hiatus that started in 1996, the Impala was resurrected by the bowtie brand in 2000 and has been going strong ever since. Spending time as the best-selling car in the U.S., the Impala is one of the top-end sedans offered in the Chevrolet lineup. The mid-size car offers plenty of options and power for various driving conditions, which makes it a great sedan for conquering a New York winter. Capability: The sedan does not offer drivers the option of all-wheel-drive, but with the powerful engine block under the hood, a MacPherson strut front suspension, and the standard six-speed automatic transmission, the Impala delivers confidence when confronted with whatever Mother Nature has to offer. Safety: As the most expensive Chevrolet sedan offering, the Impala has come with more standard safety features over the years than others in the lineup. Loaded with the advanced safety features we would expect at this price point, the Impala also includes extras like a standard roadside emergency toolkit, traction control, and the most comprehensive OnStar system available. All of these are exceptionally valuable when it comes to winter driving, which is one of the many reasons the Impala made our list. Bottom Line: Despite its exclusion of all-wheel-drive capability, the Chevrolet Impala is still a very capable sedan for winter in New York. Drivers can expect to pay more for used versions of the Impala than they would for either the Cruze or the Malibu – but the Impala does come with more standard features than the less-expensive sedans. These three cars are all highly capable of helping you confidently navigate through this impending winter, but if you are unsure of which one is the right fit for your lifestyle, come to DePaula Chevrolet and take each one for a test drive. Our friendly and knowledgeable sales staff is waiting to help you find you the used car of your dreams, at the price your budget allows. We hope to see you here at DePaula Chevrolet soon!